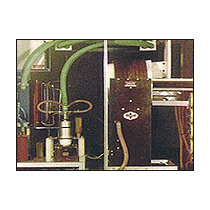 High frequency Tube Welder uses the common structure of frequency conversion such as AC-AC and AC-DC. Three phase 380V-420V power supply is sent to step up transformer before it passes through switch cabinet. 3 phase full wave rectification. Silicon diode mounted on aluminium heat sinks cooled by a water air heat exchanger. DC over current relay safety device. High Frequency Oscillator Unit converts voltage DC power from the rectifier into the high frequency energy and supplies it to the welding point through the HF output transformer and the output coil (inductor). It Is composed of pressurized all around access, Aluminium cabinet dust etc. The main supply transformer is specified in a way that the supply reactance works as a limiting factor of peak asymmetric fault current; and non-compliance with this specification can be destructive for rectifier semi-conductor devices.